After receiving his Bachelor of Science degree from Monmouth University in New Jersey, Mike pursued careers in the U.S. Navy and in electronics. His career in marketing allowed him to travel extensively both domestically and internationally and to broaden his appreciation for art and architecture. After retiring, he began to seriously follow his passion for drawing by taking painting classes and workshops at the Newport Art Museum and the Edward King Center. Among his teachers are Richard Grosvenor, Marcelle Casavant, Al Albrektson, Nancy Gaucher-Thomas, and Natalie Pfansteil. 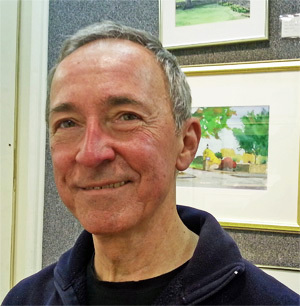 He paints seascapes, landscapes and local scenes in the Newport and the New England area. He works with a limited pallet, using subtle color that takes advantage of skillful drawing. He is a member of the Newport Art Museum and Spring Bull Gallery.